The product download email has been filtered to your Junk or Spam folder. Please check these first. The product download email is automatically sent to the email you entered upon purchasing your E-Sticker. If you purchased with a personal Gmail or Hotmail account (as some people do when they choose to use PayPal for their payment method), the product download email will go to that personal email account. Your anti-virus program is stopping the product email from coming through. Please fill our troubleshooting or contact form and we can make arrangements to send the files to you using an alternate method. This product is not a standalone program you are installing, rather it is a plug-in that runs completely within Adobe Acrobat. You will need to close Acrobat and this includes when a web browser or a preview pane is using Acrobat to view a PDF. In some cases, your anti-virus scanner will interfere with the download and installation process. Please disabling or suspend your anti-virus program before installing. Select the Tools menu to see if you have the Add-On Tools menu under the Protection menu item. If not, click on the small icon directly under the Comment tab and check the Add-On Tools selection toward the bottom of the pop-up menu. 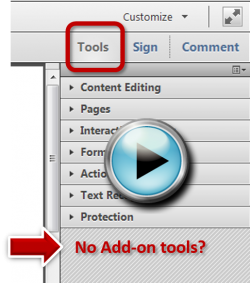 Once you do that you should see the Add-On Tools menu that is now available. Your E-Sticker Properties dialog boxes are accessible within this the Add-On Tools Menu. I can see my stamp but I don't know how to set the properties. Trying to place an E-Sticker but the sticker is greyed out. In some cases, you might receive a PDF that has been protected by the originator of the PDF file. There are certain settings when creating a PDF that let you turn off commenting, printing, copying and a host of other settings. The E-Sticker falls under the “Comments” category so check your document to see if “Comments” have been turned off. From the main menu line, go to File | Preferences | Security. This will bring up a list showing what items have been disabled by the maker of the PDF. If you can’t re-print the file or get the originator to give you an unsecured file, as a last resort, you can use a third party program to unlock the PDF. You can Google “Remove PDF Security” and you will see several options available. The manual feature on the paid version of the E-Sticker works a bit differently than the free E-Sticker so some folks might find it confusing the first time they use it. To get the manual box to pop-up you will first need to select the manual option in the properties box (See above if you have trouble locating the properties box). Next, you will select your E-Sticker from the Stamps Tool. At this point you will need to place your E-Sticker on the document. Once you place the E-Sticker, the manual box will then come up where you can then enter your information. By their very nature PDF/A documents are stripped of any metadata, stamps, annotations and anything else that can be altered in a PDF file. You can turn off the PDF/A view mode by following the steps below. Once the PDF/A view mode is turned off you should be able to E-Sticker your document. NOTE: YOU MUST FLATTEN YOUR DOCUMENT before you will be able to create a PDF/A compliant document. See our information about Flattening here: How to Flatten your PDF documents and why it’s important. Fill out the form below to get more support. Which version of E-Sticker are you using? Please enter your registration code or date of purchase if you have it. Upload any screenshots you may have.